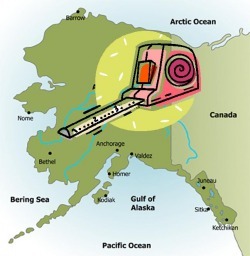 Alaska is the largest state in the nation with a very diverse population.Because of your reputation as a great explorer. You have been chosen to explore the state and report back what you learn. You will now want to go to the instructions page to get an outline of the webquest. Your first mission is to seek out some information about the geography of the state. 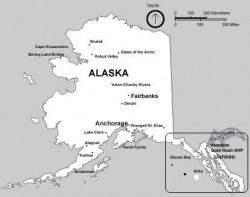 To do this go to the link below and read about the geography of Alaska and write down four facts that you find interesting. Make sure that you take good notes, because you will be asked to share what you find. Before you get to far on your journey, you should check out the movie below to see some of the real Alaska. Warning: This movie will make you laugh. You now have some general knowledge about the state that you are about to explore. You will need to keep a journal that covers each leg of your journey. The journal should contain information about the people, plants, and animals that you encounter. The journal should also include the geography of the area and what the climate is like in each region. On the first leg of your journey, you will sail up the Inside Passage of the South East Region of Alaska. 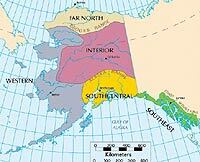 Then you will explore the South Central, North west and Yukon Regions. Click on the links below in the order that they appear to explore each region. Fill in the worksheet that your teacher has provided, or go to the teacher page and download a copy for yourself provided. Then fill in the information that you find in the appropriate area of the worksheet.